. This information is available both on desktop and on mobile for millions of commuters in Mumbai, arguably the most used public transportation network in India. Transit on Google Maps already includes information for Delhi Metro, Bangalore and Pune bus services in India in addition to 450 cities worldwide. How to use Google Transit ? Commuters would get first hand information on available routes and the step by step directions including frequency, and travel duration for each leg of the trip in text and on the map. So next time when you want to plan your trip whether from Borivali to Gateway of India or from Marol Maroshi to Chowpatty adopt an environment friendly way to commute by using bus or trains. Is your Mumbai experience authentic without having to hop a red BEST bus or having to board a crowded local train ? Its hard to imagine aamchi Mumbai without its trains and buses. 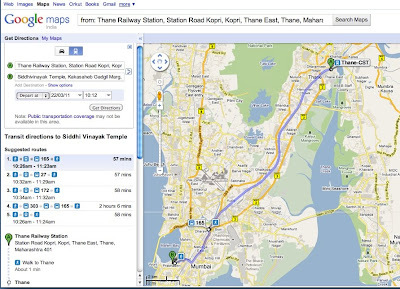 Knowing that life in Mumbai revolves around trains and buses, it gives us immense pleasure to announce the availability of BEST Bus and Mumbai Local train routes and schedule information on Google Maps. This information is available both on desktop and on mobile for millions of commuters in Mumbai, arguably the most used public transportation network in India. Transit on Google Maps already includes information for Delhi Metro, Bangalore and Pune bus services in India in addition to 450 cities worldwide.